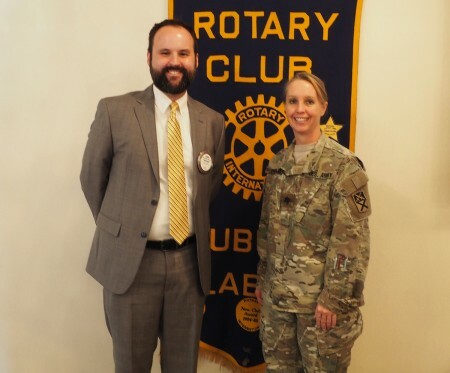 At the Wednesday, Sept. 20 meeting of the Auburn Rotary Club, Lisa Pierce (right) of Alabama Rural Ministry spoke about the nonprofit organization’s efforts to eliminate substandard housing in rural Alabama. Since 1998, through the assistance of charitable donors and volunteer groups, ARM helps provide improve the warmth, safety and energy efficiency of their homes. ARM was among the organizations recently receiving more than $30,000 in Community Needs Grants from the Auburn Rotary Club. Pictured with Pierce is Club President Chris Warren. The Auburn Rotary Club meets each Wednesday from noon to 1 p.m. at Saugahatchee Country Club. For more information about the Auburn Rotary Club or how to become a member, visit www.auburnrotaryclub.com.